It’s important to place the short story output of vastly important and influential authors into short story collections every decade or so. Although that doesn’t mean that those collections are going to be masterworks themselves. One can hardly predict how those short stories might fit together when it comes time to collect them, or even gauge the quality from decade to decade. 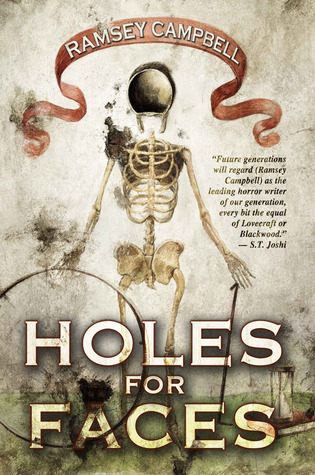 Holes for Faces is one such book, as it collects the short story output of Ramsey Campbell from the last decade or so in one place. Easily one of the most influential writers in the horror genre, Campbell has not only redefined the contemporary ghost story, but has also managed to find both critical and popular appeal in the genre for at minimum, the past thirty years. So it’s an important book based on Campbell’s vast influence and output, but is it a good book? This is a book of short story reprints with the exception of the titular story, which doesn’t appear to have been published before. There are some odd selections in here too, such as ‘With the Angels’. Based on my internet research, ‘With the Angels’ was only released as a printed chapbook. The online listing I found for its original printing suggests it is 300 pages in length, and its Amazon page suggests the chapbook itself doesn’t actually exist when you try to purchase it. This book focuses heavily on Campbell’s work in the ghost story sub-genre and less on his very particular “urban grotesque” work. While the author is often very good at blending both of these things together, many of these short stories are very traditional ghost stories. That said, this is definitely a distinctive Ramsey Campbell collection, as all his usual elements are still evident here: children, Christmas, vacations, telephone/internet communication, film, and madness. With the exceptions of ‘Peep’ and ‘Chucky Comes to Liverpool’, and my personal favorites from the selections, ‘Getting It Wrong’ and ‘The Decorations’, a lot of these stories feel like they are rehashing old territory. ‘Holes for Faces’ leans towards the more literary side of things in the most clichéd sense of the label ‘contemporary literature’. And while it’s an interesting experiment, it is upon its conclusion, a straightforward ghost story. And that renders the rest of the unique narrative pointless. I did find some interesting minor changes in the work. I found a lot of crime fiction elements in many of these stories, and some political commentary as well, which struck me as unique to Campbell’s usual techniques. Overall however, this is probably not a good introductory book to Campbell’s work, and I suspect those interested in the authors output from a critical standpoint might find this largely rehashing his previously covered ground. I would recommend this to readers who have enjoyed what they’ve read of Campbell’s fiction in the past, but aren’t overly studious of technique or particularly interested in the scholarly aspects of the authors work. Of course, all of my opinions are void if a reader is simply looking to read some quality ghost stories – as this may be a definitive work of that particular sub-genre.